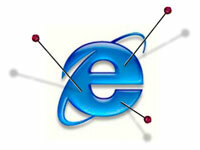 IE logo with pins graciously borrowed from Make Your Own Internet Explorer Voodoo Doll â€“ A Step by Step Guide, originally from Teresaâ€™s DeviantArt forum post. Very touching indeed. Thank you for making me see things from an entirely different perspective. Beard plucking, ode's to IE, and pictures of toys. I'm starting to see a pattern that involves a new hedonistic lifestyle. You are IE, aren't you?